Strategies are synthetic spread instruments where the legs are options, futures, or spreads. Strategies are created on the exchange and are exchange-traded instruments. The price differential between the legs is guaranteed. Strategy creation is not available when running X_TRADER in simulation mode. However, you may access and trade all strategies that exist in the production markets. When enabled, the Hide New Contracts property blocks new strategies from automatically appearing in the Market Grid when they are released. This property is enabled via the global properties Trading tab. When creating volatility strategies, do not assume a sign on the delta. You must include the sign when creating this strategy. The sign of the delta indicates whether you are buying or selling the underlying. + Buying / - Selling. Delta in this context acts as a hedge ratio and declares the number of futures that must be bought (or sold) to offset the risk of the options position. The Create Strategy window allows you to quickly create and deploy strategies. You can launch the Create Strategy window from the X_TRADER Control Panel by selecting the button, Market Explorer, the Market Grid right-click context menu, or the Hotkey (grave accent key below the Esc key). You can also launch the Create Strategy window by selecting Create Strategy from the X_TRADER Control Panel Window menu. Left-click a contract cell to invoke Instrument Explorer. Type values into the Search filter fields to filter instruments. Replace any instrument seeded in the contract cell with the desired contract. 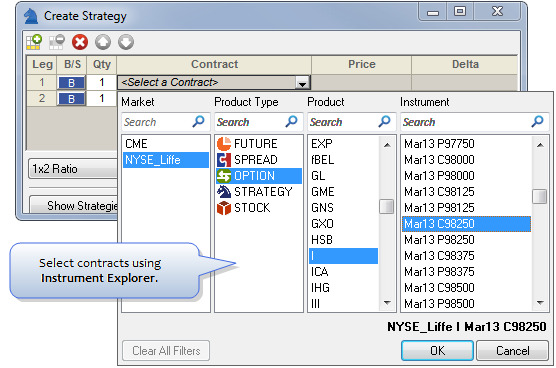 Ctrl + left-click to highlight Calls and Puts in the Contract column. Press C (Calls) or P (Puts) on the keyboard. Drag and drop the selected contracts into the Strategy Creation window. If you pressed C, only the Calls are seeded; if you pressed P, only the Puts are seeded.